A DIY Fuel Cell Conversion? …which the device injects into your car's fuel system to BOOST your fuel economy. The makers of these devices are claiming it will increase your gas mileage to 100 mpg or more. How cool is that? Basically, they're saying it's just like an electric car conversion kit, but the hydrogen car version: DIY for much cheaper, and produce your own hydrogen, save a lot of money. Right? speculate how you might even manage to get “results” with an HHO booster in your car, but which are not actually results at all; just a trick of the light, so to speak. Sound like fun? All right! Let's do this! What the heck is HHO? HHO, also known as “oxyhydrogen”, also known as “Brown's gas” (I think it's got a few other aliases too, like those boys Daddy warned me not to date), is just a mixture of hydrogen and oxygen gases in a precise ratio that is the same as water: two parts hydrogen to one part oxygen. If you put enough electricity to plain old liquid water (237.1 kj/mol, a 'mol' of water being 18 grams), it will start to bubble hydrogen gas from the negative pole and oxygen gas from the positive one (this part is true – it will do that, and it's just called electrolysis). Collect it in something that doesn't leak, and voila, you've got yourself some homegrown HHO. HHO, according to the boosters of the HHO booster (sorry), can be generated with your car's starting battery facilitated by a gizmo, collected by same gizmo, and injected into your car's fueling system. The volatile mix of gases is supposed to enable complete burning of your fuel, increasing your engine's efficiency and improving your gas mileage to 100+ mpg. For only $350. (Or $1900, depending.) Such a deal! Before we get to the math, let's warm up with some history. Where did this whole notion get started? Once upon a time, back in the '70's, there was a gas crisis. People wanted to find alternatives to petroleum products to run their cars because of the oil crisis from the OPEC squeeze. Remember that? I was a little girl, but I remember waiting in long lines at the gas station with my family. Inventors got busy trying one thing and another to improve fuel efficiency, and one of the ideas that stuck was that water could be used as fuel; split into its component gases, hydrogen and oxygen in a 2:1 ratio to burn in your car's engine (along with regular gasoline, in the current version) and that would be a cheap, efficient, simple way to increase your gas mileage to 100 mpg or more. A fellow named Stanley Meyer stood out as one of the most convincing of the inventors. He was a tall, good-looking (ish) guy with a little education who was good at cultivating relationships at the US patent office and having friends in oddly high places. His built a dune buggy that split water through his gizmo, using an ordinary battery and ordinary water, and it did NOT use gasoline at all – just burning the hydrogen and oxygen mixture it achieved 100+ mpg (of water). When investors wanted to try the gizmo for themselves to see if they could reproduce the results, he wouldn't allow it. His device was not special, the experts said – it was only capable of ordinary electrolysis, which requires a huge amount of energy input per mile (math is in the next section) and so Meyer was convicted of fraud in 1996 and forced to repay 25k that he had accepted for research and development. After Stan's death by aneurism 2 years later, his brother Stephen began producing the “HHO booster” you can find online today for $350, which works on the same principles but is only offered as a supplement to a regular gas-guzzling engine, not actually replacing gasoline or diesel with hydrogen or brown's gas. In 1997, a man named Dennis Lee began promoting a similar device, the HAFC (hydrogen assisted fuel cell) as a free energy gizmo using water, and costing $1900. Or, you could buy yourself a dealership for $300,000 and sell and install the devices as a business. Cash cow! Only...it doesn't work as advertised, either. More on that in the video. To convert just one gallon of plain water into hydrogen and oxygen gas, it requires a little over half my LEAF's battery pack worth of electricity to do: 13.85 kwh. Here's what I did to figure this out, so you can check my math. 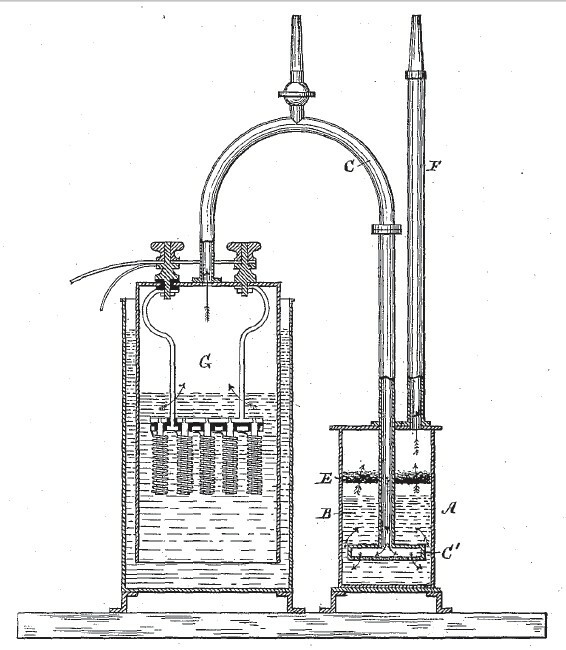 The electrolysis of water by ordinary means, not involving magic spells or time travel, requires 237.1 kj per mole of water. A mole of water is 18 g (grams). A gallon of water, according to Google, is 3785.4118g. Converted to friendlier units of energy, that's 13.85 kwh. I'm pretty sure we could put 13.85 kwh worth of energy to better use in a car with an electric motor, but okay. I don't have a problem with him doing electrolysis to get Brown's gas to burn in his car, if that's what he wants to do; but his 12v battery only provides about 1 kwh of energy. Where's the rest coming from? Who knows? But it's NOT. An honest-to-goodness fuel cell is a device which converts the energy from fuel into electricity through a chemical reaction, similar to a battery in many ways (except that instead of recharging, it is refueled). The HHO booster gadget is so named apparently because it is a “cell”, and it produces “fuel”. The two are in no way related. Do the 'boosters' really believe it works? Maybe. But as Google.org proved with their Recharge IT project, drivers can affect their mpg quite a lot through conscious driving. In the Google project, a group of drivers got Priuses to drive for a while, and their mpg was recorded. Then after the experiment was finished, the drivers got to keep their Priuses and drive as they usually would, and their mpg was again recorded (but they didn't know it) – and their mpg went way down. During the experiment, the Google guys were trying to get better gas mileage, so they were hypermiling, as competitive people will do when they want to win the gas mileage game. After the experiment was finished, they were just trying to get to work. If the HHO booster guys were trying to show “double your gas mileage” results after they installed a gadget, they would drive more like a hypermiler. (We EV drivers already know that works.) But if the HHO booster guys wanted to prove their device worked, they'd have to take human nature into account and test under the exact same conditions, excluding other factors like hypermiling, which is what Dateline did. I like the part (part 2, I think?) where they took the gadget OFF and it got better gas mileage than with the gadget ON. Can't argue with disinterested third party observations!